What a change in the weather! Easter Monday was sometimes overcast but often surprisingly sunny and most importantly dry all day. This was round 3 of the HSA championship (or to give it its official title, the SBD Motorsport HSA Speed Championship) and my first HSA event of the season. However, overnight I decided definitely to sell the Van Diemen and return to a roadgoing class. I just hope I can do some deals quickly enough to score some decent points in another class. There were about a dozen HSA members at Loton and quite a few more people who I always think of as HSA but who for various reasons haven’t signed up this year. Most often the reasons are that the class is undersubscribed or that they are are unsure how many events they will be doing due to other commitments. For this meeting I was asked to write the report for the HSA’s website and I started the day by talking to Leigh Andrews who did nine HSA rounds in 2012 but due to work commitments in the US last year only managed the final round at Curborough. However, he’s back again for 2014 determined to do more events in the championship and with his trusty RX8 looking very smart for the new season. As we talked about why he liked the HSA and the championship I thought I should record the conversation for the HSA website report and decided to video as many HSA people as I could. This I did and I think the results are pretty good considering I simply used my phone and didn’t do any second takes or editing. It was a bit hectic at times running around looking for people between my own runs but I got it done more or less. More or less because, when I got home I realised that the one person I had forgotten to video was Leigh! Big apologies! Next time I see you Leigh we’ll make a feature! A biopic! Peta Marshall was at Loton spectating and I asked her to take some photos of HSA people for Speedscene and all the photos that follow in today’s blog are hers. Many thanks, Peta. On the subject of photography, Peta pointed out that it is very frustrating for the public sitting at Triangle to have their view of the track impeded by official photographers standing between them and the track. We are indebted to the official photographers for the great action shots they get, but I do think she has a point. It is the main public viewing area and even if you get a shot of a car, when the photographers are there invariably there will be fluorescent jacketed photographer in it. Anyway, as I’ve just written a HSA website report I may as well paste that here as I think it says it all. I’ve had a great two years in the single-seater, learnt a lot, changed ratios in a Hewland gearbox and met a lot of interesting people. I never did crack that 60 second barrier at Loton but there will be other challenges, hopefully in a classic roadgoing car. Round 3 of the HSA Championship. Fourteen HSA members turned up on a sunny and dry Easter Monday for the third round of the SBD Motorsport Speed Championship, which was run by Hagley & District Light Car Club. Going into this round Mike Hawley in his Honda S2000 was leading with 28 points, with ex-S2000 driver Matt Carter in his Radical PR6 and Gavin Neale in his Peugeot 106 both just one point behind. Jon Fox was the only contender in Class A1 (Road-Going Series Production Cars up to 1400cc) and almost set a new HSA class record on his first competition run. Jon recorded a time of 69.96 in his Peugeot 106 XSi just three tenths behind Richard Stephens’ class record set in a Peugeot 106 Rallye in 2012. In Class A2.1 (the popular special class for MX5s) Tony Thomas and Michael Tindale were present, driving cars from either end of the MX5 spectrum – Michael in his old, high mileage and more or less standard Mk1 and Tony in his new and much more powerful Mk3 and showing that you can have fun in both. Michael was 7 tenths off his personal best and Tony broke his own HSA class record with a time of 66.11 earning him a useful 16 championship points. 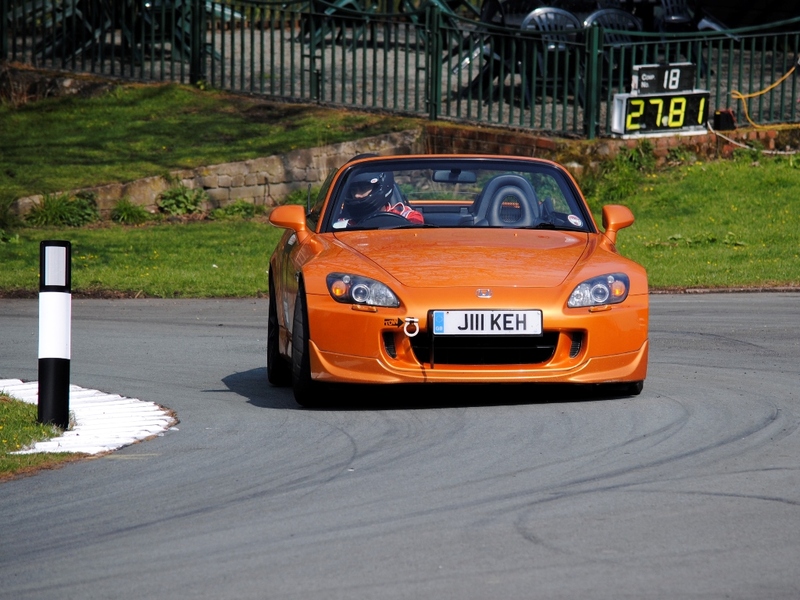 In Class A2 (Road-Going Series Production Cars 1400cc to 2000cc) neither Mike Hawley (S2000) nor Leigh Andrews (Mazda RX8) had been to Loton before. If you had seen Mike’s car after his Harewood accident last year you might have thought it would be written off but here it is looking like new and leading the championship. Leigh’s car has also had a makeover during the winter and looks very smart in its new paint. In the competition Mike got the better of Leigh and with a time of 67.95 smashed the existing HSA record by almost three seconds and in so doing collected enough points to stay ahead in the championship. All these HSA classes were grouped together in the HDLCC’s class 1B for Roadgoing Series Production Cars up to 2 litre, which was won by David West in an 1800cc Peugeot 106 GTi in a time of 63.13 seconds. In Class A3 (Road-Going Series Production Cars over 2000cc) Paul Trill (Turbocharged Mazda RX7), Peter Cox (Suburu Impreza) and Brian Marshall (3.2 litre Porsche 944SE) vied for points, though because Brian had entered the Classic Marques Handicap Challenge he ran with HDLCC’s Class 14 well after the others ran in Class 1C – Roadgoing Series Production cars over 2 litre. Peter, who has been up Loton in 50.27 seconds in his Chevron B42, was the fastest of the trio with a time of 61.74 in his Scooby. Brian, who has competed in a Porsche 924S and 944 Turbo and is now driving a 944SE recorded a personal best in practice of 65.06 but couldn’t match that in the afternoon when his best time was 65.18 and Paul, in his first ever hillclimb, improved on every run, which is what we all want to do but often can’t. In C2 (Modified Limited Production Cars up to 2000cc) there were three competitors – Paul Drowne and Colin Satchell sharing a Peugeot 205 and Keith Murray in his Audi 80 Quattro. Class C2 matched HDLCC’s class 3B exactly and attracted nine entries and was won by Keith in a time of 55.96 with Colin and Paul taking second and third in class respectively. Keith’s time of 55.96 is a personal best, a new Loton class record and a new HSA class record. Colin and Paul also broke the standing HSA record of 58.23 and in doing so scored extra points. In J1 (Formula Fords up to 1994) I was the only HSA contender but could not get near my personal best of 60.76, recording a best time of only 62.46. However, the interest in this class was Samantha Lester who is being mentored by Richard Summers, whose Van Diemen RF80 she is sharing this year. Richard was the fastest of the Formula Fords with a 59.38 and Samantha recorded an outstanding 61.58 in her first event in a single seater. In Class W2 (Classic Racing Cars, 1976-1983) David Tilley was the sole competitor in his magnificent 1980 Formula Two Toleman T9280R. He competed in HDLCC’s Class 11 (Racing cars over 2000cc), which was won by Scott Moran in his new Gould GR-55, but David’s participation in the class added a lot of interest. His time of 55.92 was just over a second off John Burton’s HSA class record of 54.76, which John set in a Ralt RT3. In Class U (Classic Road-Going Saloons up to 1976) John Harrison undoubtedly provided the best spectacle of any of the competitors as he wrestled his huge 5.3 litre 1958 Dodge Coronet up the hill. Everyone held their breath as he squealed around each corner, the whole car lurching from side to side and threatening to tip over, with John driving single handed, his left arm out of the window to hold on for dear life and stop him sliding across that very long bench seat. At first many of us thought it was all a joke and it would end in tears, but John completed all four runs – a testament to his skill and bravery and the car’s reliability. There’s only one other car registered in this class – Daniel Ward’s Saab 96 which is undoubtedly much quicker, but I hope we get to see them go head to head and that John and Daniel can have a good battle for class honours – completely different cars but a welcome addition to our championship. There was no previous record in this class so John now holds it with a time of 83.05.